At the height of the LTTE terrorism in Sri Lanka, a delegation from the Council of Churches in the UK visited home on a peace promoting exercise. Upon their return, Sinhala expatriates in London had an inter-action meeting with the team that visited Sri Lanka, which turned out to be a vociferous confrontation. To counter the myth that dominated at home at the time to the effect that ‘the expatriates’ involvement or contribution to help their mother country was much to be desired, the meeting that took place in June 1999 was published in a Sri Lankan daily by the same writer. This is being dug out from the archives and reproduced in a sequential format in the Life Abroad Column for the benefit of those who were not aware of the incident and/or who were lachrymose and pointed a finger at the expatriate Sinhala community for their lack of enthusiasm in helping the motherland in the hour of need. The venue was London, it took place on the 27th of June 1999, at the height of LTTE terrorism when the Council of Churches in Britain and Ireland decided to take a keen interest and a prominent role to diffuse what they termed as an ‘unhealthy situation in Sri Lanka,’ thousands of miles away from their land when in fact, at their very doorstep, IRA problems existed without any proper means to resolve their own problems. Council of Churches for Britain and Ireland appeared to be committed to God’s mission on earth, while its members seemed to believe that they, as Christians, could not cut themselves away from the problems of the world, and the Church was duty bound to try and address any conflict situation anywhere in the world! They, therefore, idolised getting involved and being part of the proof of trying to promote peace in Sri Lanka at any cost. That was surely believed to be the life of the church! In such a backdrop, with good intentions and objectives, the Council of Churches in Britain and Ireland sent a delegation to Sri Lanka at the invitation of the Christian Council in Sri Lanka to ‘observe the existed situation’ at home. The team of representatives consisted of Rev. Norman Taggart (Methodist Church of Ireland), Rev. Dr. Andrew Wingate (Church of England) Fr. Pat Davis (expired on February 16, 2010)) and Dr. Elizabeth Harris (Methodist Friends of Peace). Rev. Fr. Pat Davis discharged his celestial duties attached to the St. Sebastian and St. Pancras Church at Hay Lane, Kingsbury, NW of London at the time. In the same diocese at Kingsbury lived an associate priest from Sri Lanka, Rev. Fr. Christopher De Silva. 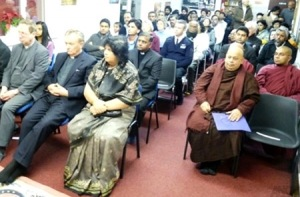 Sri Saddhatissa International Buddhist Centre at Kingsbury, affiliated to the World Buddhist Foundation, being in the same neighbourhood had a common factor in service when it came to Interfaith Movement activities. In view of this kind of correlation, Fr. Davis on his return from the ‘Sri Lanka Peace Mission tour’ contacted the chief incumbent of the SSIB, Ven. Galayaye Piyadassi to brief on his team’s experiences in Sri Lanka. Ven. Piyadassi suggested that it would be most fitting if he (Fr. Davis) could give a reflection on their fact finding tour to a Sri Lankan audience, mainly the Dayaka’s of the Centre. Fr. Pat Davis mutually agreed and a meeting took place at the SSIB Centre on June 27, 1999, at 8.00 p.m.
Ven. Piyadassi advised the packed audience of Sri Lankan expatriates that the meeting was arranged only to pay attention to his (Fr. Davis) observations during their peace mission to Sri Lanka, and it was a rare opportunity for Sri Lankan expatriates in London to give an ear to the church delegates’ observation and comments. He also stressed that it was an occasion to discuss any relevant points and iron out any objectionable and/or inappropriate areas before an official report was published by the Church delegation to Sri Lanka. Wimal de Silva, a retired member of staff from the Sri Lanka High Commission, who was a senior devotee at the SSIB, officially introduced Fr. Davis as one of the delegates who had been to Sri Lanka as part of an organisation called the Churches together in Britain and Ireland to observe the existed situation in Sri Lanka, seeking ‘a solution for peace and reconciliation’. Though it was not categorically stressed, the forgone conclusion among the Sinhala audience was that Rev. Fr. Davis and the Christian team had been sent on a study tour to monitor the war situation in Sri Lanka. Fr. Davis had all the requisite qualifications to be chosen for such a mission as a Christian, with his past experience in conflict, peace and reconciliation background, particularly after working as the Assistant General Secretary of the Catholic Bishops’ Conference in Wales and England with an added know-how on international affairs. At that time he functioned as a part-time moderator for the Church in Britain and Ireland and had a particular interest in peace and reconciliation issues in South Africa and Bosnia. In such a backdrop, he possessed all the qualifications to be included in the ‘promoting peace and reconciliation’ tour to Sri Lanka. Fr. Davis outlined their Sri Lankan tour at the outset by displaying a traditional map of Sri Lanka instead of referring to the distorted map that the LTTE had marked north and the eastern areas of the country in red as ‘traditional Tamil home land’! He continued his discourse by elaborating on the areas covered as Kandy, Vauniya, Mannar, Madhu, Anuradhapura, Batticaloa, Puttlam, Kalpitiya, Negombo, Panadura, Bulathsinhala, Hiniduma and Weligama. He appeared quite contended having had the opportunity of speaking to a ‘full spectrum of Sinhalese, Tamils, Buddhists, Christians including the Catholic priests and the Buddhist clergy’ in areas mentioned. The audience however took a dim view at this stage, particularly when they noticed that Jaffna had been avoided completely in the visiting group’s agenda. The whole purpose of their visit was believed to be to find out whether there was a demand for third party mediation at all to ‘the problems that existed in Sri Lanka’. Naturally, several persons in the audience interrupted him, but Father Davis disregarding such turbulences maintained that their visit had been organised with the blessings of the Sri Lanka Government! Ultimately, excusing himself that he was not a good public speaker, he suggested having an interactive question and answering session with the audience. One of the popular Sri Lankan characters in London at the meeting was Wijeratne (George) Parapitiya who resembled the late President R. Premadasa as an identical twin to a certain extent in appearance. George was once in Sri Lanka on holiday and went to meet with the chieftain of the Veddha community Uruwarige Wanniyalaththo. The confused chieftain’s remarks were: “Ah Manhituwa Maha Uramarilakiya” (I thought the Chief had died sometime ago!) – mistaken identity for the late President R. Premadasa! “Father Davis, obviously it was not a religious visit, am I correct? Father, you and your colleagues went to observe an existing problem in Sri Lanka, but not to resolve whatever there was. Your delegation was asked to meet with some people and ask questions! May I ask you then, what sort of inquiries did you make from the Tamils, Sinhalese, Churches and the Buddhist monks”? Parapitiya was not convinced and raised another question: “Fr. Davis, I am still not clear whether your delegation was on a religious basis or something to do with any other matter”! Father Davis at this point simply smiled at Parapitiya and kept quiet! This entry was posted on Saturday, August 30th, 2014. You can follow any responses to this entry through the RSS 2.0 feed. You can skip to the end and leave a response.